In a past life I was a Captain on a fishing boat, at least that is what I like to tell myself. I love life on the water. Im a fisherman through and through. I bought a new boat this year and cant wait to use it next year. I am married with children. 2 boys, both young adults. Both of them are great and respectful young men who are as enthusiastic about fishing as I am. My wife is my rock and my life. We love to travel. We are also dog lovers and foster dogs for a non-profit organization. Truly warms our hearts to help out with dogs in need. Also breaks our hearts when they leave our home. However, we know they are going to a good home so we don’t mind too much. Ive done just about everything under the sun as far as work is concerned, and found a hankering for wood working. I really enjoy wood construction and architecture. I started my career installing carpet about 25 years ago. I worked my way into a warranty position, handling warranty issues and found I also have great customer relation skills. I was offered a position as a lead for a restoration company doing catastrophe clean up in Biloxi, Mississippi. I lived there about 8 years. After 8 years of dirty work I decided to better my working conditions and pursued a position in construction doing carpentry. This is when I fell in love with wood working. I have strived to be the best I can be at what I do. 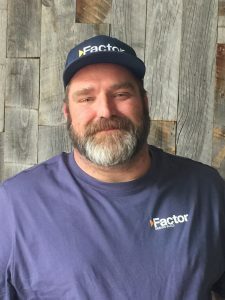 I have spent the last several years working for Design /Build firms in Denver and am happy to say I think I found my home at Factor Design Build. I am very approachable and have had some great customer reviews in the past. I am anxious to get out in the field and welcome new challenges. As long as I’m learning and expanding my knowledge for construction, I’m a happy man! I am so excited and grateful to have been chosen to work with such a ‘talented’ and “organized team” of professionals.